Bali is everything you need for any kinds of retreat. If you want to have peaceful retreat, it gives what you want. Choosing one of Bali villas is the first step you need to do because location affect the atmosphere. If you want peaceful retreat, might as well book a villa with calm neighborhood so you won’t be bothered with loud noise or constant buzz while relaxing. Even though Bali is a very popular travel destination, it doesn’t mean you won’t get a chance to experience peaceful retreat. There are many villas where you cannot notice loud noise both from tourists or the locals. However, you need to make sure to find it right. Hacienda Villas have Spanish delight just like their name. They are situated in the heart of Bali. This consists of several villas you can book. What makes these villas interesting are the Mexican touches and their surroundings. These villa are arranged in a row in the middle of rice paddy. Located in Canggu, this place offers absolute serenity. Don’t be fooled by their traditional appearance from the outside because the inside is decorated and designed in the mix of traditional and modern vibe. There are also garden as well as pool you can enjoy for relaxing. Bali Bill Villa is situated in Seminyak, one of the most urban areas in Bali. However, this villa is designed in Balinese décor dominated by calming colors. This villa consists of three bedrooms which are comfortable and spacious. There are also individual swimming pool with sunroof. For quality bonding, might as well using barbeque facilities provided by the staff. Grand Bali Villa is situated in Legian. It has Balinese touches and homey vibe. This villa is great for a couple to have romantic retreat. You can have dinner in front of the pool which brings peaceful yet romantic atmosphere. Wood ornamentation dominates most of the décor. This villa also has aesthetic dining and living area. The pool is not too large so it is suitable for lazy basking with your partner instead. 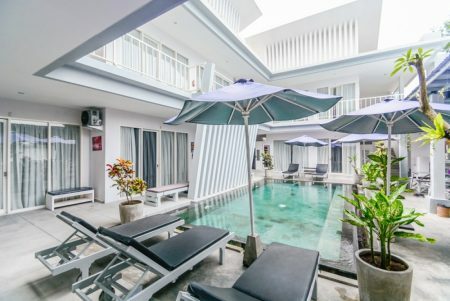 Bali Swiss Villa is situated in Seminyak. It has family-friendly outlook but it fits for both family and couple. This villa offers extra comfort for the guests by providing three large bedrooms, private pool, and tropical garden. You can also have your spa in this villa to untie the knot in your muscles. This villa is designed in mix style of traditional Balinese and modern vibe. The amenities are luxurious which makes your stay just more perfect than you could ask for. Make sure to book this one of the best family-friendly Bali villas few weeks prior your arrival especially if you are planning to have a weekend getaway.